The Face Beautiful in the Boat of a Million Years - A study of the religion, mythology and customs of the ancient Egyptians. The Blood of Vine from Cups of Gold - A study of the religion, mythology and customs of the ancient Canaanite people. Conception of the Demi-urge -A study of the mysteries of the ancient religion of Gnosticism. Sage of Bavel - A study of the writings of the Jewish prophet Daniel. I created the Nazarene Cipher over the course of seven years. It stands thirteen feet high and six feet wide and features one hundred and eighty-six illustrated panels. It was constructed using a number of unique materials including wood, Paper Mache, sculpted clay, costume jewelry, glass, stone, metal, pearls, animal hide, and gold leaf. The work is dimensional and juxtaposes flat, painted surfaces with raised, sculptural elements, some lifting two inches or more off the surface. I have always had a deep fascination for religion, ritual, mythology and folklore. 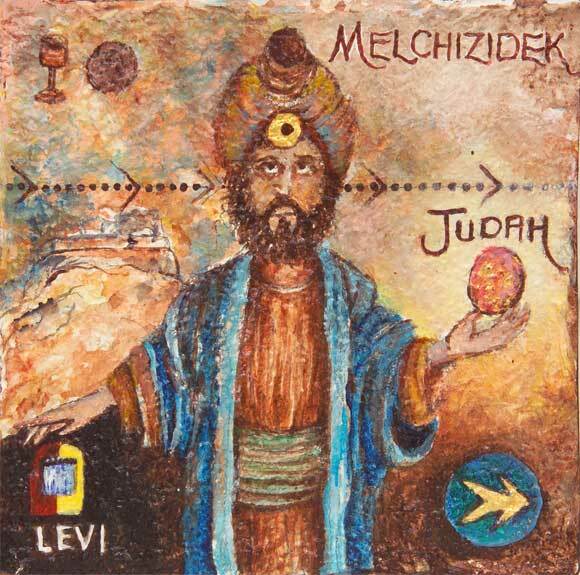 While a brief perusal of my other work might give you a sense of my wide and varied theological tastes, the Cipher focuses upon the unique relationship between two of the most foundational religions that have dominated my cultures (English and American), namely Judaism and Christianity. Although sharing many points of similarity the relationship between the two has been tenuous at best, with the occasional descent into heated argument, violence and outright persecution. "The Nazarene Cipher is dedicated to exploring the Jewish roots of Christianity and placing Jesus firmly back in His historical and cultural context. In spite their original solidarity, a vast and yawning chasm now separates the two camps. The ‘Jewish Yeshua’ has become separated from the ‘Christian Jesus’ and Judaism is viewed more as the ‘Christ killer’ rather than the womb that gave birth to Him. This is theological madness and needs to be corrected sooner than later; the further Christianity detaches itself from its’ Jewish roots the easier it will be to see them as the enemy and a source of evil. To demonize the Jew (which has ironically been the historical stance of the Church) is to demonize Jesus, the Jew. This connection between Judaism and Christianity is the single, most important key to unlocking one of the greatest mysteries of all time. The New Testament is a book written by Jews (except one, Luke) about a Jew living in a Jewish world, who possessed a distinctly, Jewish worldview. Everything He said, did and related to were derived from His experience as a Jew. He was certainly not some religious ‘kook’ who drifted in off the street to pitch a self-styled, half baked, religious philosophy to a group of total strangers; His person, life, ministry and audience were all rooted in that specific, cultural context." The Nazarene Cipher was created in three sections, each one carved from maple. These sections slot together and hang as a single piece on the wall. Each one has a series of 12 x 12 cm wooden panels attached to it (see below). Each panel has been meticulously hand crafted and painted using various materials. The entire piece weighs a little more than 110 lbs.